---- - North American geology was born in Troy, New York and voyages on the Erie Canal were perhaps the first American higher education field trips. ---- -The science of geology sprouted from the construction of canals. The initial birth began in English canals. The improbable founder was William Smith, son of an Oxfordshire farmer, and with little formal education. He was a curious lad, who loved to explore the woods and fields near his home. He had a passion for collecting fossils. As a young man his curiosity led him to a knowledge of geometry,mapping, and through an apprenticeship, surveying. At age 18, he was an assistant surveyor -- just in time to begin work surveying routes for the new canals being dug in Britain. His background of careful observation led him to observe the rock through which the canals were dug. ---- -In 1796, at age 27,, he wrote: "Fossils have been long studied as great curiosities, collected with great pains, treasured with great care and at a great expense, and shown and admired with as much pleasure as a child's hobby-horse is shown and admired by himself and his playfellows, because it is pretty; and this has been done by thousands who have never paid the least regard to that wonderful order and regularity with which nature has disposed of these singular productions, and assigned to each class its peculiar stratum." He used his observations of rock type (lithology) with his knowledge of fossil successions, and found he could correlate rocks throughout the digging of the Somerset Canal in southwest England. The rocks in the region suddenly became recurrent and predictable through his understanding. The study of layered rocks, Stratigraphy, was born and the principles he expounded are still used today. ---- -William "Strata" Smith drew geologic maps of the local area, and was the first to use 'index' fossils, as well as lithology, to correlate the layers. 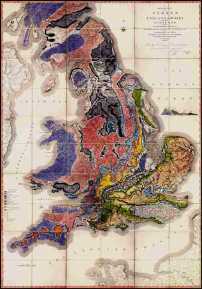 He traveled extensively throughout Britain, and his personal goal was to create a geologic map of the entire country. He had little money and no connections to learned or wealthy society. His map was financed by contributions from 400 'subscribers' and was published in 1815. Because of his humble social status and lack of formal education, scientists largely ignored his work. However, in 1831, he finally received his well-deserved recognition when the Geological Society of London awarded him its highest award for the founding of the science. "... it was he that gave the plan, and laid the foundations, and erected a portion of the solid walls, by the unassisted labour of his hands." ---- -Before 1831, there were two important centers for the study of the science of geology. London, the largest city in the world, at that time, and Troy, New York, with a population of about 10,000. In both places, it was due to canal construction and the presence of two brilliant men who were excellent observers of fossils and rocks. ---- -When the first construction contracts were let for the building of the Erie Canal in 1817, there was very little published about American geology. England first had William Smith, America followed with Amos Eaton. Eaton was trained as a lawyer, but his keen interest in natural history soon had him mapping geology and botany. He conducted a geological survey in Massachusetts. It was the first time field trips were used for geological instruction; a method today used by all U.S. colleges. Also, in 1818, Eaton published a textbook, with a local field guide and a time and rock classification chart. This also became the standard for geological teaching and publication in this country. 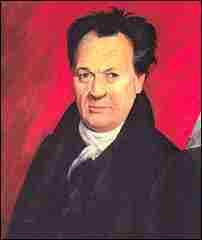 ---- Fortuitously, in 1819 the New York Legislature hired Stephen Van Rensselear as the President of the Central Board of Agriculture. Under the board, but at Rensselear's expense, Eaton was hired to publish two geological studies to improve agriculture in the Albany area. ---- -From 1823 to 1824, Eaton, with Rensselear's support, conducted geological studies along the route of the Erie Canal. His revolutionary study resulted in new and precise names for the rocks of New York. Eaton used many of William Smith's techniques in composing his maps. ---- -In 1824, Eaton asked Van Rensselear for $300 to start the Rensselear School (now RPI), which he eagerly did. 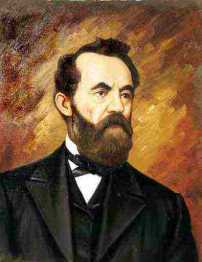 Eaton was the first professor. By 1830, he published a textbook and geologic map of the entire state. Eaton was a remarkable educator. He created unique methods of instruction, with students in the role of teacher. He stressed laboratory and field trips, an innovation that is standard instruction today. He also believed in the education of women in the sciences. His teaching was enthusiastic and he sparked interest and curiosity in his students. So much so, that by 1860, seven of his students became noted geologists, and were responsible for geological surveys of their own. ---- -Joseph Henry, one of Eaton’s students who cut his geological teeth along the Erie Canal, later founded the Smithsonian Institution and the Library of Congress. --- -Those interested in the history of North American geology refer to the period from 1818 to 1836 as the Eatonian Era, and recognize New York as the beginning of geological study of the continent. By 1836 his work in New York set the precedent of state sponsored geological study, that continues to this day. In that year, James Hall, a titan of North American geology and one of Eaton's students, was appointed New York State's first State Geologist. His geological work became the standard for geological surveys throughout North America. The nomenclature he evolved is learned by college students of geology today. 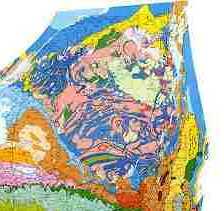 ---- -Aren't geologic maps beautiful? This one, of New York State, should be framed and hung over the fireplace as a piece of marvelous modern art. Take a moment, and just appreciate the colors and patterns. ---- -OK, now to the geology. Each color represents a different age of rock.There are reasons for the patterns. We'll start in the southeast corner. Notice that Long Island is a nondescript mess -- well it should look that way, since it's a pile of geologic 'garbage.' The great ice sheets that plowed across the state in the last Ice Age, scraped everything loose off the state. That glacier was a mile-thick thousand-mile wide conveyor belt that ended where Long Island is today. So the 'junk' plowed off the state (and much of Ontario and Quebec to the north) was ignominiously dumped there at the end of the conveyor and piled up in a mound. Geologists call that mound at the end (or along the sides of glaciers, also) a moraine, and in the case of Long Island a Terminal Moraine since it's at the end of the ice sheet. Long Island has two tails on the east end, the result of two ice advances with two moraines (they coalesce and are superimposed to the west). ---- -Now notice that the entire eastern side of the state is a collage of roughly north-south color bands. All those ancient rocks are crumpled up like a rumpled carpet -- the result of two continents in head-on collision 300 million years ago. Read about that collision in our story entitled Rockbound, the Geology of the Appalachian Mountains. ---- -Human history is often dictated or strongly affected by geologic history. Nowhere is this more in evidence than in the historical development of that most important economic engineering event in the early history of America. Without New York's unique geology, there would have been no Erie Canal and the course of history may well have taken a different tack. ---- -The Appalachian Mountains isolated the new American States, to a degree disproportionate to their size. They didn't have the glacial-crowned summits of the Rockies, Alps, or Himalayas. They were, however, heavily wooded, and there were few low passes suitable for a wagon road. There were only three roads through the mountains in 1818 since the traverse was so expensive and difficult. Consequently, the 13 original states were more isolated from the American west than from England. ---- -There was, however, a geologic break. The Hudson River, scoured deeply along a north-south route by the great Ice Sheets, provides a sea-level path across the Appalachians, as they bend northeasterly across eastern New York. This route was in part scoured by three great floods 13,350 years ago as a moraine dam near New York City was breached. Glacial Lake Iroquois, occupying an area the size of present Lake Ontario, dropped a total of 120 meters with a huge volume of water eroding the Hudson Valley to a depth of more than 60 meters below sea level. The Appalachian Trail, a footpath from Georgia to Maine, follows the summit of the range. When El and I walked the trail, we crossed the Hudson River at Bear Mountain Bridge. Albany, well to the north of us on the bridge, is on the western side of the mountains -- through the barrier! 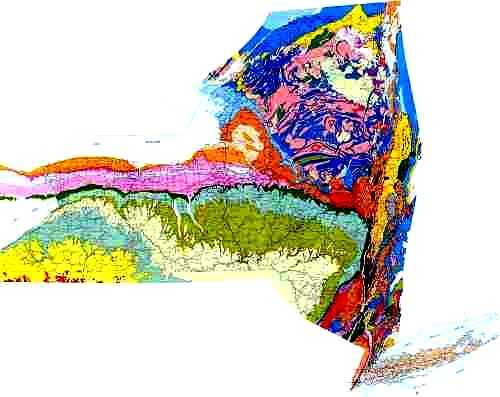 ---- -Notice on the geologic map, that there is a roughly-circular hodge-podge of colors north of Albany and filling most of the northern part of the state. This region looks like the geology has been stirred up with a giant mixmaster -- and, in a sense, it has. These are the Adirondack Mountains, an area of ancient rocks (about 1.3 billion year-old) more akin to the rocks of the Canadian Shield, north of New York state. These rocks were once at least 27 kilometers below the present land surface, down in what geologists call the basement. They have been uplifted into a large dome by a hot spot below the earth's crust. Uplift has been in relatively recent time (during the last 50 million years). In fact, they are measured as still uplifting at a rate 30 times as fast as they are eroding. This lofty and geologically muddled terrain effectively blocks transportation routes to the north, except along its eastern edge through Lake Champlain. ---- -There is one area of the geologic map that has an orderly pattern of color stripes -- in the central and western portions of the state. These belts of colors represent times when a shallow sea covered all the region to the west of the Appalachians. The bedrock in this region is mostly very gently south-sloping beds of shale, with a few prominent weather-resistant beds of limestone and sandstone. These beds contain numerous well-preserved fossils from about 500 until 300 million years ago. The hard beds resist erosion and, with the gentle southerly slope of the beds, form east-west cliffs. The soft beds also lie east-west. Erosion of these weaker belts results in east-west streams and rivers, such as the Mohawk, Seneca, and Clyde Rivers and Ganarqua (Mud) Creek, all used by the Erie Canal. The soft beds were also nicely aligned for the excavation of the east-west canal. In fact, two-thirds of the canal is constructed in these soft rock belts. ---- -Think about it. If you had thiis geologic map in 1817, how would you plot the route of a proposed Erie Canal? ... a route to connect the Atlantic Ocean with the Great Lakes? ... a water route across the barrier of the Appalachians, opening up trade and commerce between the fertile farmlands west of the mountains and the manufacturing centers to the east? ... a route for emigrants to settle the American West and have an economical trade, military and transportation route from the West to the Atlantic Ocean? Of course! You would follow geo-logic. Ships could sail the Hudson from the Atlantic northerly to Albany at sea level. They would offload to barges, and these would be towed up though locks, to cross a few hard beds, and then follow the east-west route of the Mohawk River that would itself be following the east-west trend of the ancient shales and limestones. What a perfect geologic setting for a canal. ---- - Of course, it wasn't as easy as this sounds. There were difficult terrain problems: the Mohawk Valley was narrow and offered little space for locating a canal above flood levels. There was a sag north of the Finger Lakes that required excavation through unhealthy swamps and wet ground. 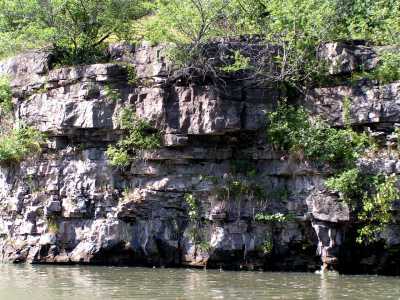 In the west, the 60-foot hard rock of the Lockport limestone made the high Niagara Escarpment. This is the same tough rock that makes the rim of Niagara Falls. To force through a canal, workers had to laboriously chop through that rock to create the Deep Cut and a flight of five locks. This was the last and most difficult part of the entire project. 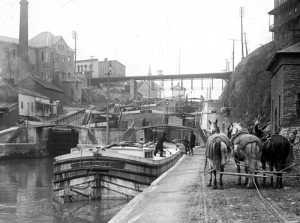 ---- The building of the Erie Canal was one of the most significant achievements for the young United States. It was the largest and most historically significant public works project of its day, and helped our new country earn an important place in the roster of nations. ---- -It was also the motivation for scientists to study rocks and their layering. It's construction gave birth to the geological sciences in North America.